Can Jimmy Vesey Expedite the New York Rangers' Rebuild? Can Vesey Expedite Rangers’ Rebuild? The list of lineup challenges that the New York Rangers’ management and new coaching staff will have to answer before dropping the puck next season is long and evolving. One of them, certainly, is carving out a role for Jimmy Vesey. Vesey, who chose the Rangers after turning down both the Nashville Predators, who drafted him, and Buffalo Sabres, who traded for his rights, has had an up-and-down first two years in New York. His growth, should he take a step forward in his third year as a pro, could be key for the Rangers’ rebuild. Like J.T. Miller and Pavel Buchnevich, Vesey struggled to gain former head coach Alain Vigneault’s trust. Consequently, even after a 16-goal rookie season, he spent a large chunk of the season on the fourth line and played less than 12:00 in a game a dozen times and less than 10:00 on seven of those occasions. Early in the season, Vesey’s struggles to “find his game” were plainly evident on the scoresheet. After tallying nine points in the first 10 games of his rookie campaign, he was scoreless for this season’s first eight games and didn’t register his ninth point until the Rangers’ 26th game on Dec. 1. In addition to not scoring, Vesey failed to consistently compete across all three zones. He doesn’t seem to have the defensive intuition that would ever make him a regular penalty killer, but a minus-5 rating overall and five performances with a minus-2 or worse suggest more than just a lack of defensive prowess. Vigneault was patient, initially, and gave Vesey 14:21 a night, often on a line with Kevin Hayes and Miller, until that point, but Vesey’s stagnant production earned him just 13:22 per game over the next 30 contests. Vesey, to his credit, seems to understand the value in the peaks and valleys that a young player can go through. After sitting for the final 22:45 in a November contest against Columbus, he expressed his disappointment but, also, recognition of how important it is to learn from benchings and setbacks. Providing more than words, Vesey responded to the benching against Columbus with a strong two-goal performance in a win against Boston. 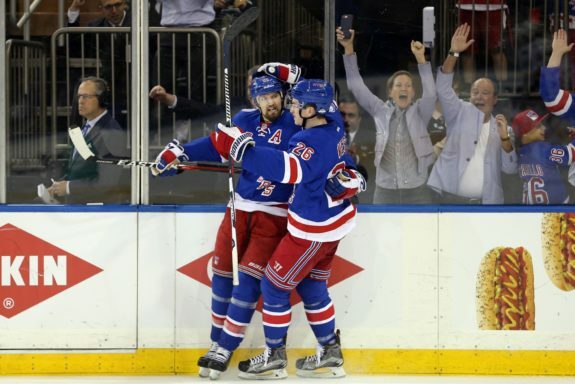 While the goals were nice, it was the compete level and commitment on both ends that Vigneault appreciated. If the lesson here is that commitment to a 200-foot game is key to success in the NHL, management’s hope must be that this specific moment sticks and helps guide Vesey’s growth. Can Vesey Build on a Strong Post-Deadline Run? Perhaps more important than a specific moment against Boston is the way that Vesey elevated his game since the trade deadline. As lineup spots opened when Rick Nash, Michael Grabner, and Miller were traded, Vesey saw an increase in ice time and has played some of his best hockey. While other young guys, like Brady Skjei and Buchnevich, failed to elevate their games, Vesey was productive and consistently noticeable. In 19 games since the deadline, Vesey registered six goals and four assists—good for a 26-goal, 43-point pace over a full season—while averaging 15:52 per night. 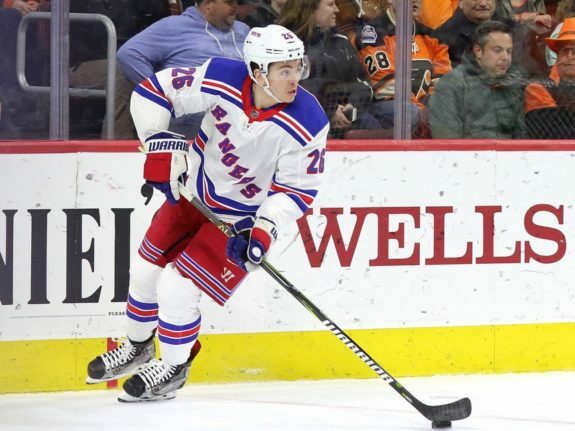 He also showed a willingness to dedicate himself to a complete game, as he was a plus-3 and ranked sixth among Rangers forwards who played more than one game since the deadline with a shot attempt percentage (SAT%) of 45.54. Though an SAT% below 50 is generally poor, the entire team’s struggles in this regard and top-six possession numbers will help give Vesey an inside track to a top-six role next season. Moving into next season, the new coaching staff will have plenty of options for deploying Vesey. He’s almost certainly going to slot into a middle-six role, but he could be used in a number of different ways. If Vesey’s 200-foot game continues to develop, perhaps he can partner with Jesper Fast on a defensively solid, tough minute-eating third line. Or, as he’s shown a proclivity to mix it up in the tough areas in the offensive zone, maybe he can give you a Brendan Gallagher-like 25 goals and good power-play minutes. In entering his third season, Vesey, who will soon turn 25, will have every opportunity to showcase the talent that earned him the Hobey Baker award while at Harvard. If he’s able to build upon the lessons learned under Vigneault and his strong last quarter of this season, he can be a valuable asset to the rebuilding Rangers.